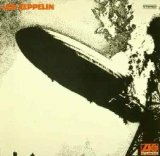 Dr. Rock's Blog & Roll: Album of the Day: Led Zeppelin (1/12/69) 41 Years! Album of the Day: Led Zeppelin (1/12/69) 41 Years! The original (and many believe still the best) heavy metal band, Led Zeppelin (click here for my LZ playlist) was formed in mid-1968 by ex-Yardbirds guitarist Jimmy Page, who recruited John Bonham, John Paul Jones and Robert Plant to his band when his dream of a supergroup featuring himself, Jeff Beck, Keith Moon and John Entwistle failed to materialize. By summer’s end they’d played several dates in Scandinavia as The New Yardbirds, then changed the band’s name and secured a recording contract and fat advance from Atlantic Records. Led Zeppelin’s debut album was recorded in a total of 36 hours in several sessions during October 1968 and released on January 12, 1969. It’s a great blend of different styles and moods, with most of the songs coming from the band’s set lists from the just-completed Scandinavian tour. Notable tracks are two decent Willie Dixon blues covers (“You Shook Me” and “I Can’t Quit You Baby”), a longer, tougher blues-rock original by Jimmy Page (Dazed And Confused"), the frantic, punk-precursor “Communication Breakdown,” a sweetly folksy acoustic instrumental “Black Mountain Side” and the rolling “How Many More Times.” The lone single, “Good Times Bad Times” reached #80 on the U.S. Billboard charts in the U.S. and is #19 on my 25 Best of Led Zeppelin playlist. Led Zeppelin is available as download tracks from iTunes (click here) and as a CD and mp3 downloads from Amazon (click here).